The number one emotional detriment to the Leonine Moon is their pride and their ego. Because they are also one of the four fixed signs, the phrase pride goeth before a fall is a slogan for these rather emotionally stubborn Moon signs. As a Fire sign they are full of passion and often express their emotions physically. Leonine Moons are likely to be people who have no trouble with public displays of affection. They are often the initiator in a relationship and in control of its physical expression. 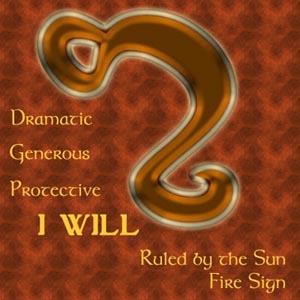 Like their companion, Aries, in the Fire sign triplicity, instant gratification is essential. As lunar Fire sign personalities, those with Moon in Leo are magnanimous and passionate in the expression of their feelings. Unfortunately, Leos tendency for exaggeration can lead to being viewed as insincere. The excitement of a particular moment may cause them to sincerely and passionately say or do things that may later be forgotten. They have difficulty distinguished emotions from ego. It is ego that prompts them to consciously or subconsciously dominate emotional relationships. For those of us who work with a Leonine Moon personality, it would be wise to exercise caution. Above all do not wound the pride of a Leo. This is a case of catching more flies with honey than with vinegar. Leo Moon personalities can be extremely stubborn. They have purpose, determination, and tenacity when it comes to getting what they want. Strongly idealistic, they are capable of great personal sacrifice for causes in which they passionately believe. If proven that the cause that they believed in was deceptive, if will often take the Leonine Moon forever to come to the conclusion because of their pride. Again, tenacity and stubbornness come into play. They are very assertive when it comes to protecting not only their own freedom, but the rights and freedoms of others. They have a jealous nature, though they are not particularly possessive. When a romance ends, they are more apt to suffer from a wounded ego than a broken heart. Leonine Moons are likely to have artistic talent, or at least great interest in art, architecture, and design. Famous Women Leonine Moon Signs: Bambi Bembenik, Bernadette, Jacqueline Bisset, Lizzie Borden, Lucrezia Borgia, Catherine Deneuve, Marlene Dietrich, Faye Dunaway, Jane Fonda, Anne Frank, Ruth Gordon, Martha Graham, Queen Latifah, Gypsy Rose Lee, Eva Peron, Julia Roberts, Jane Seymour, Gloria Steinem, Margaret Thatcher and Twiggy. Famous Men Leonine Moon Signs: Joseph Campbell, Winston Churchill, Jacques Cousteau, Benjamin Disraelik, Queen Elizabeth II, Mohandas Gandhi, Mikhail Gorbachev, Robert Graves, James Joyce, Jack Lemmon, Gordon Liddy, Martin Luther, Paul McCarney, Teolonius Monk, Wesley Snipes, Ringo Starr, Ed Sullivan Mao Tse Tung, Peter Ustinov, Van Gogh, and Vivaldi.